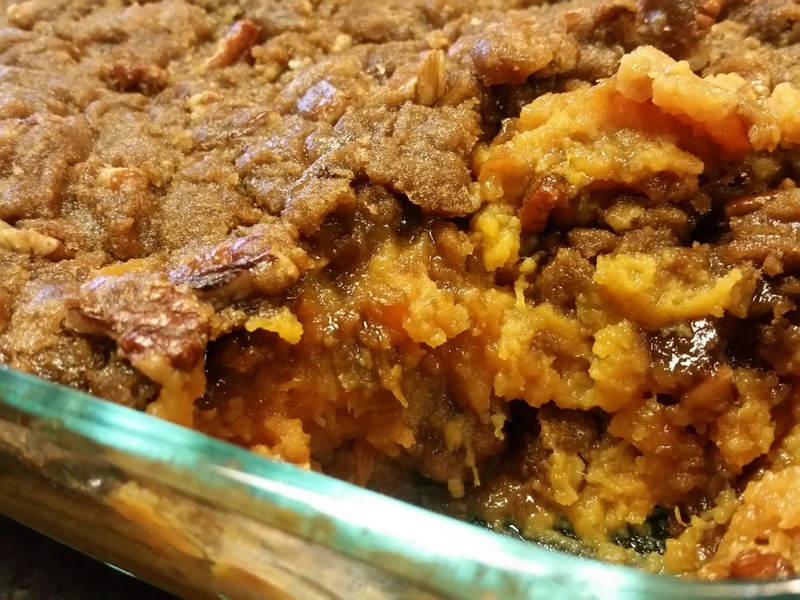 In the South, a holiday table always includes Sweet Potato Casserole. Although I am not a native southerner, this treat has really grown on me! Of course, anything topped with brown sugar, butter and pecans must taste good. Some people prefer Sweet Potato Casserole that is topped with marshmallows, but I prefer the praline topping. Enjoy. Preheat oven to 350 degrees. Place sweet potatoes on a parchment lined baking sheet and cook until the potatoes are done. (When gently squeezing the potato, it will give and feel soft). Let the potatoes cool until you are able to handle them. Cut potatoes in half, and scoop out the flesh into a large bowl. Mash the potatoes. Discard skins. Spray a 9 x 9 baking dish with non-stick spray. Add 1/2 cup butter, milk, eggs and vanilla to the potatoes. Stir until well mixed. Spread into prepared baking dish. To make the topping: In a small bowl, whisk the 1 cup brown sugar and flour. Using a fork, cut in the butter until mixture is crumbly. Stir in the pecans. Spread this mixture over the sweet potatoes. Bake for 30 minutes until bubbly and golden brown. This entry was posted in Holiday Recipes, Lookout Point Lakeside Inn, Vegetables and Potatoes by admin. Bookmark the permalink. My mom used to make this but added a small can of crushed pineapple with juice to the mix.